Home Archive by category "Custom Letterpress Products"
In the letterpress studio, we make use of old-world technology to print unique items like personalized monogram stationery and nameplates for baby journals. Yes, we do weddings! 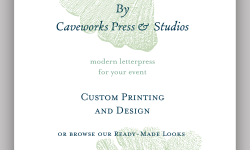 Currently typesetting from our collection of 100+ metal typefaces and customizing with linocuts and digital designs, Plan your wedding suite or personal stationery with us. Like this design? Make it yours, contact us to begin.